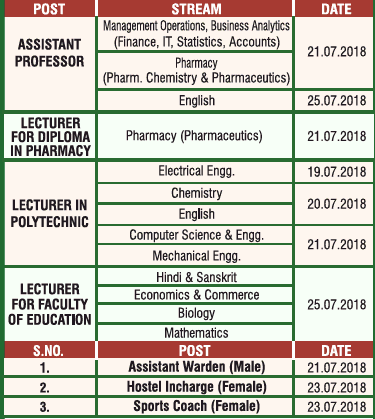 GLA University, Mathura has advertised in THE TIMES OF INDIA newspaper for the recruitment of Teaching Faculty-Assistant Professor / Lecturers Plus Non-Faculty jobs vacancies. Interested and eligible job aspirants are requested to walk-in on 19th, 20th, 21st, 23rd and 25th July 2018. Check out further more details below. About University: It was in the year 1998 that Shri Narayan Das Agrawal took the initiative to fulfill his father’s dream and laid down the foundation of the GLA Group of Institutions that later grew to become the GLA University through the U.P. State Legislative Act of 2009 (UP Act 21 of 2010). How to Apply: Interested and eligible candidates are requested to attend the Walk-in interview along with all originals & copies of certificates and recent passport size photo to the walk-in address given below. Reference: Advertisement from GLA University, Mathura on THE TIMES OF INDIA newspaper dated 18th July 2018 for the recruitment of vacancy position such as Assistant Professor / Lecturers Plus Non-Faculty jobs. See the copy of advt below.